The other night, I needed a fast supper since we had to be at a friend’s house in less than an hour. I knew I needed to make sure everyone had eaten, so I started scrounging the pantry to see what I could find. 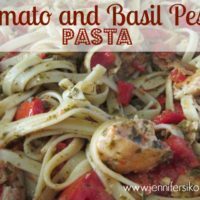 Thankfully, I remembered that I had this Tomato and Basil Pesto Pasta recipe in my “to make” file, so I grabbed the recipe and started cooking. This recipe is very easy to make and doesn’t take that long at all. 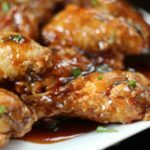 Browning your chicken takes the longest portion of this recipe — and from start to finish, when this delicious dish is in your belly, maybe takes about 35 minutes TOPS! In a large saute pan, saute the garlic with 1 tbsp olive oil until it’s fragrant. Add the pesto sauce to the garlic combine well. Pour in the chicken broth and olive oil and bring to a simmer. Add in the chopped tomatoes and stir well over medium-low heat. In another pan, season 3 chicken breast tenderloins with salt and pepper and brown over medium high heat for about 6 minutes per side. Remove from heat, let sit for a couple of minutes and then dice up and add to pan with pesto sauce. While chicken is cooking, cook the pasta as directed and then add it into the pesto sauce mixture. Keep the heat on medium-low and let the pasta absorb the flavor. Top it all off with a little more Parmesan and serve immediately! 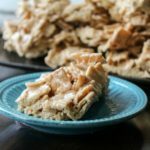 This recipe is super quick and turns out SO delicious every single time! This is serious comfort food at its finest. 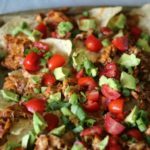 Would you like to join us at #15MinuteSuppers? We’d love to have you! 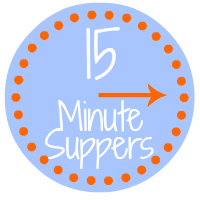 Please check out the 15 Minute Suppers website or ask to join the Facebook group (for bloggers) to participate on Fridays…we’d love to have you join us. Sounds absolutely delicious. Definitely need to try this! I think I must be hungry. My mouth is watering! That looks so tasty! The pesto looks so pretty with the red of the tomatoes. Seriously craving pasta now! This looks so good. 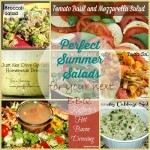 I’ll definitely be trying this recipe! Sharing it everywhere! 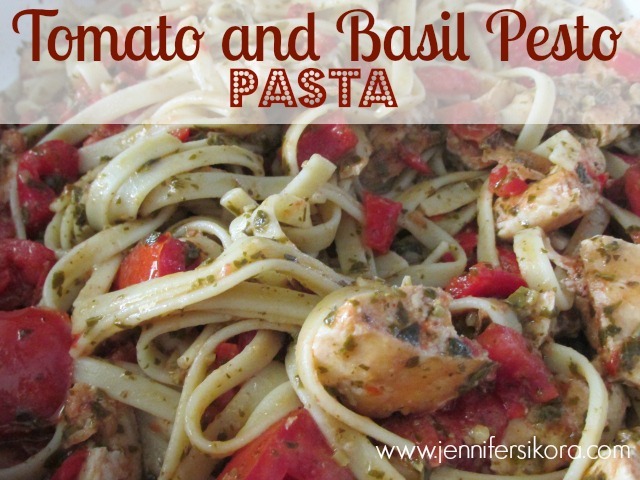 Oh my pasta and pesto, what an awesome combo.